“It is a truth universally acknowledged that” fans of the 1995 A&E and BBC co-production of Pride and Prejudice will be very pleased with this latest incarnation of the beloved mini-series. Painstakingly converted to hi-def and presented in Blu-ray format enhanced with a collection of new featurettes, this set belongs in the collections of fans and Jane Austen enthusiasts. When Pride and Prejudice came to television as a six episode mini-series in the mid ‘90’s, it was an instant hit and helped to spur on “Austen-Mania” that exists even today. A combination of good actors such as Colin Firth playing the proud Mr. Darcy, and Jennifer Ehle as the feisty Elizabeth Bennet and careful attention to scenery, costume and daily living details of Regency England, make this production a stunning complement to Jane Austen’s words. It set the bar for authenticity and attention to author’s intent when re-creating the past with television dramas. Pride and Prejudice is the favorite Jane Austen novel of many, and has been dramatized a number of times. Each production has its merits and flaws. For many this is the best, because of careful screenwriting, genius in cast selecting, and a sense of it being real, that it is possible to peek in on the Bennet family as they squabble, or on the Bingley sisters as they find fault with the neighbors to impress Mr. Darcy. By the end of the story, one feels as if these are friends or acquaintances, and that the action continues on in life. As much as they love this production, fans have long been dissatisfied with available reproductions of the series, the earlier being too red in tone, and the later having a washed out appearance in an attempt to rectify the color mistakes. This new Blu-ray has perfect color, and a wonderful appearance. Other reviewers have spoken of a “graininess” in the picture reproduction, and I really think this depends a lot on your set up and on your personal taste. The resident scientist and I can’t agree on what looks “clear” on any production or player, so what may be “grainy” looking to one might be “sharp” to the other. In any event I did not find anything objectionable in the quality and reproduction of the picture, and it is much better than what we have had to view. This Blu-ray is presented in a two disc set with a playing time of five hours and twenty three minutes for the series. There are some really nice specials added to the set, and my only complaint would be that the short featurette from the DVD Special Edition of a few years ago was not included. 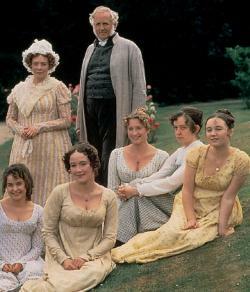 However, there is “Lasting Impressions” where interviews with cast and crew investigate the popularity of both the novel and the series, as well as how characters were developed from Jane Austen’s words and the actor’s particular take on them. In “An Impromptu Walkabout with Adrian Lukis and Lucy Briers, these two cast members Wickham and Mary Bennet give recollections of filming and memories of production as they tour a setting. “Turning Point” discusses how this production of Pride and Prejudice and how its attention to details changed how historical dramas were made. Finally the featurette “Uncovering the Technical Restoration Process” is the revelation of the journey it has taken for the production to be restored. Using the 16mm film negative as a starting point, Pride and Prejudice has been converted frame by frame into an incredible HD format. This conversion took much time and many talents, and viewers will enjoy seeing how the transformation took place. Pride and Prejudice [Blu-ray] is now available at Amazon. Visit the DVD database for more information. Note posts made on our older Talkback system will still show below. However, new posts can only be made via the new system (above). We will export the old comments to the new shortly. You can still comment as a guest on the new system but it also allows you to login using various social network and other accounts. 7 Clips To Pride and Prejudice Online! 4. G.I. JOE: The Rise of Cobra hits DVD and M&C;’s giving away prize packs from the film! © 2003 - 2009 by Monsters and Critics.com, WotR Ltd. All Rights Reserved. All photos are copyright their respective owners and are used under license or with permission. * Note M&C cannot be held responsible for the content on other Web Sites.